The Reolink Argus is a solid 100% wireless home security camera. Unlike the majority of other cameras, this one is powered by batteries. No A/C cable. That means you need to periodically replace the batteries in this camera. This article will discuss how to replace the batteries in a Reolink Argus home security camera. We’ll also discuss how to prolong battery life and make a few recommendations for replacement batteries. A Reolink Argus requires four lithium CR123A batteries for power. There’s a battery life indicator within the app. The manufacturer predicts a battery life of 500 minutes of recording and up to 180 days of standby time. Your results will vary depending upon the amount of camera use. The more it’s used, the less the batteries will last. The batteries aren’t overly expensive but it’s something to be aware of. We reviewed the Reolink Argus a few months ago and liked the camera a lot. However, our experience is that your batteries will likely last far less than the manufacturer stated time period. That’s especially going to be the case if you have motion detection active. The more motion, the less your batteries are going to last. And we’re talking a lot less. Potentially less than a month between battery changes. Helpful tip is to turn off the PIR sensor or limit the use to a time of day. The Reolink smartphone app tells you when it’s time to change the battery. The app shows the amount of power remaining. There’s a very short period of time between when it shows as full versus when it’s out of juice. At least that’s our experience. Best advice is to check the battery indicator at least once weekly. So let’s discuss how to change out the batteries in a Reolink Argus. The photo that accompanies this article has a close up of the bottom of the Reolink Argus. You will need to open up the camera. Not as easy as it looks. See the little button beneath the arrow? That needs to be pressed in using something that is flat and small. Don’t use anything that is drawn to a magnet as the magnetic bottom makes it difficult. As you are pressing that button all the way in, separate the two halves of the camera. It comes apart right in the middle. This will expose the battery compartment where four batteries will be seated. Like any battery operated device, simply remove the batteries and replace them. Be sure they are facing the right way. Once the camera is closed back up, the camera will be accessible. Now you get to place it back on the mount. 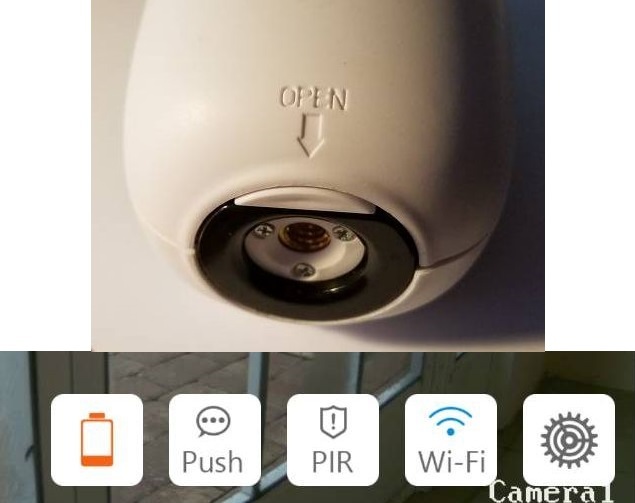 Be sure the button that was pressed to open the camera clicks back in place. It’s important the camera remains tightly sealed since it is outdoors and exposed to the elements. Be sure to get the right batteries for your Reolink Argus camera. Reolink recommends four non-rechargeable CR123 lithium 3-volt photo batteries. You can also use four rechargeable CR123A batteries in a Reolink Argus with a voltage of 3.6V-4.2V. Stick to name brands on the batteries. They will last longer versus most off brand. We prefer Energizer CR123 Lithium Batteries. These batteries are reliable and will last longer than most other brands. Given the effort needed to take the Reolink Argus off the mount, open it up and replace the batteries, you will likely find this to be one of your least favorite activities so minimize the number of times you need to do it. If you’re going to use the PIR sensor or simply want to save some money on batteries long term then consider rechargeable batteries. Consider the Tenergy Rechargeable CR123 Batteries & Charger. You can save a lot of money over time and these rechargeable batteries are actually marketed for security cameras. Avoid alkaline batteries in a Reolink Argus as they will not last anywhere near as long as Lithium. While the initial cost of an alkaline battery is lower, the longer term cost would exceed the more expensive lithium option. Don’t forget the additional effort of more frequent battery changes with alkaline. Don’t wait until the batteries in a Reolink Argus Home Security Camera are down to almost nothing until replacing. Keep some on hand for the next time the battery indicator starts getting low. If using rechargeable batteries, keep four spares ready to go.